Rachel Hartman's debut novel is an absolutely fantastic piece of fiction! Seraphina eclipses all other fantasy debuts of the year so far with it's lyrical writing and Hartman's vivid imagination. Seraphina is a strong girl with a dangerous secret. She lives in a world where dragons and humans skirt around each other in distrust and sometimes curiosity. She's a peculiar girl who has visions of strangers she calls 'grotesques'. When Seraphina begins to see some of them bleed into her reality and forges a bond with them, Seraphina comes even more alive with mystery. The story is set in first person perspective and Seraphina's thoughts are completely honest for readers. Her loneliness, humility, and compassion are the height of her character and spurs her to do much for herself and her newly found friends. As Seraphina grows and learns from her mistakes, she becomes the heroine that makes reading something to look forward to. 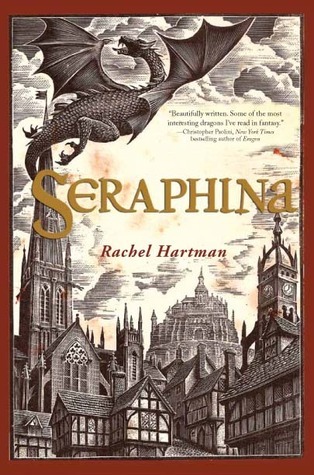 Seraphina is an addictive novel that will capture the attention of readers from all age groups. Even those who aren't yet fans of the fantasy genre, where the worlds are completely unfamiliar and filled with imaginative cultures and languages, will fall in love with Seraphina and her journey to save the peace between humans and dragons. The fact that Seraphina is only the first in a series makes it that much more exciting to read. The novel is full of events that lead to a big finish, so one can only imagine what surprises await in Dracomachia! Read the prequel story, THE AUDITION, on Scribd! !